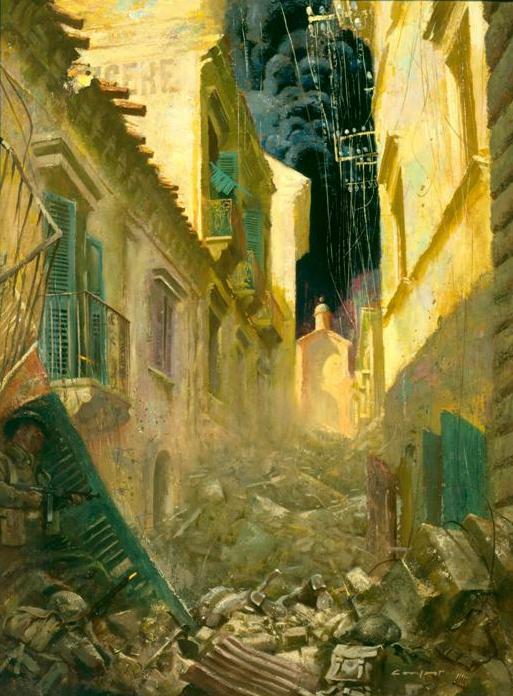 "Via Dolorosa, Ortona" by Charles Comfort. ‘The two pioneers went to work to prepare the first ‘Beehive’ on the top floor. To get the right height they placed the ‘Beehive’ on a chair and leaned it against the wall. While the ‘Beehive’ was being set I gathered all my men on the ground floor. With the fuses set the pioneers tumbled down the stairs, and as they reached the ground floor, there was a loud explosion. We all tore up the stairs in order to get through the mouse-hole before the dust subsided, but there was no hole. What we thought was one wall was actually two walls. Against we set a ‘Beehive’, went through the same routine as before, and this time found ourselves in the next house.